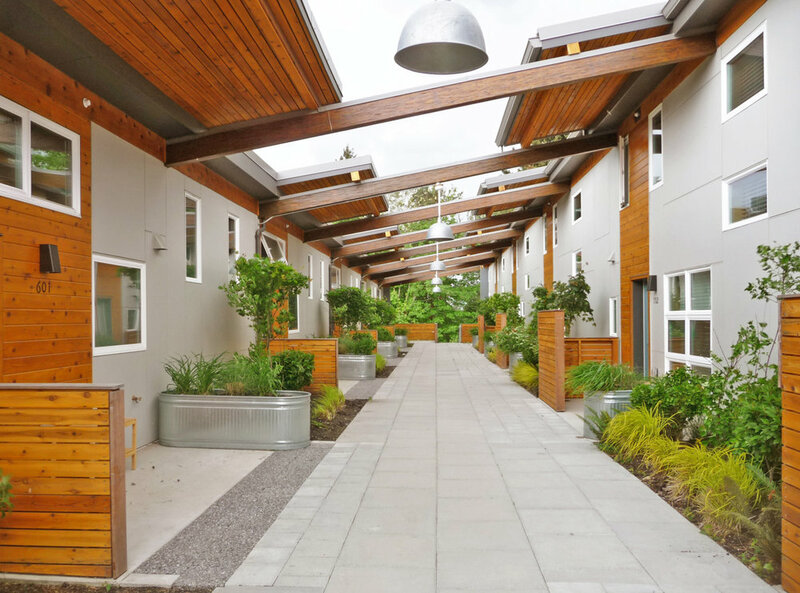 The Place of Hidden Waters demonstrates a new model in culturally and environmentally responsible housing for the Puyallup Tribe and Pacific Northwest region. The project consists of 20 new units of housing built in two phases, renovation of and addition to an adjacent community building/gymnasium, and energy-efficiency upgrades to 26 existing townhomes. Intended as a prototype to be replicated at other sites on the reservation, the new housing structures are designed to emulate the shed-roofed form of a traditional Salish longhouse, using a variation of the modern courtyard townhouse building. Like a traditional longhouse, they feature central, linear common areas for gathering and circulation to private dwelling areas. The project achieved LEED for Homes Platinum certification, and was awarded both the LEED for Homes 2012 Project of the Year as well as a 2013 SEED award for Excellence in Public Interest Design.